Bedtime is such a sweet time to cuddle and read to little ones. After they get a bath and put on their comfy pjs, everyone is clean and happy. I have the sweetest bedtime board book to share with you today. 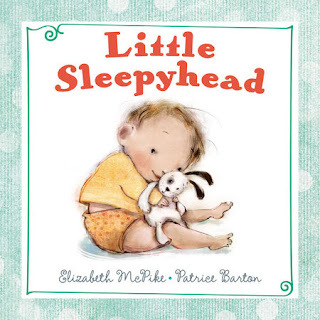 Little Sleepyhead written by Elizabeth McPike and illustrated by Patrice Barton shows us several babies and their caregivers. We get a glimpse of them starting to wind down for the day while enjoying the time with walks, snacks and even a story. Baby’s bedtime is more cuddly than ever! By the end of a busy day, little knees are tired from crawling, little arms are tired from stretching—even little lips are tired from blowing kisses. But with the help of gentle verse, and art as sweet as a bedtime lullaby, tired little eyes will quickly give way to sleep. This book is just so sweet. From the wonderful tale with it's rhythmic story to the cutest angelic baby faces. I also love that many nationalities are represents across the pages. The board book makes is nice for little hands and keeps it sturdy for lots of reading. This book is simple and beautiful!